Is getting on-and-off the floor challenging for you? Whether confronted with injury or severe weight gain, the problem is the same: you don’t have the freedom to move as you wish, and this creates a lot of frustration. I have been in the same place struggling with debilitating pain, unable to lie down, nor walk, not even drive. I hit a plateau where medication had no effect. Life wasn’t fun anymore: it was agony. The doctor’s verdict was grim: I must have surgery or face paralysis of the left arm. But I listened to my inner voice: I heard about the healing potential of yoga and decided to give it a try. Finally, it downed on me to use a chair, and that was the turning point. I didn’t have to get on and off the floor, which had been a big hindrance. I could approach a wide variety of poses as the chair allowed me to modify as needed. Soon the pain decreased substantially. From the darkness of those moments of pain and fear the idea for Anychair Yoga emerged. Now let me tell you what it can do for you. Strengthen your core, and tone abdominal muscles. This program is unique because you get variations for each potentially problematic pose. These variations apply to common injuries of the back, neck, knees, hips, and shoulders. Core strengthening is a main component of Anychair Yoga. Q: I have never done any form of exercise. Would this program too complicated for me to follow along? This program is an ideal start into exercise. The guidance is very detailed, with options to follow in case you need modifications, and many pictures to complement the written instructions. The chair allows building up intensity in small increments to make your progress smooth and safe. 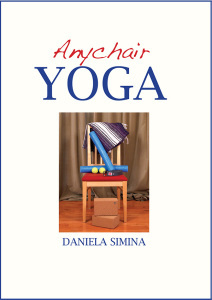 After mastering the material in this book you may want to try the Anychair DVD, or move directly into a mat practice with Yoga Fundamentals DVD. Q: I travel often by plane and I always arrive at destination with a painful back and stiff neck. Can this book give me any tips on quick recovery from such hassle? Besides the many tips on quick recovery from pain and stiffness associated with spending long hours seated, “Anychair Yoga” teaches you what to do during airplane or train travel to prevent such pains.